This image, taken by a Twitter friend @tavigreiner, caught my eye. 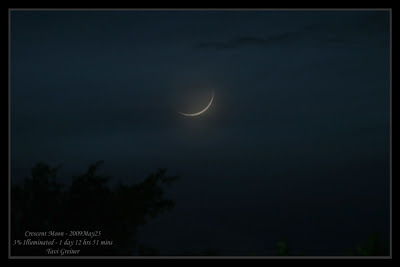 It's a picture of a very thin crescent moon, only 1.5 days old. Finding a moon this new can be a challenge, and finding pictures of it as nice as this is rare. This photo made the Amateur Astronomy Photo of the Day! Just figured I'd share this one with you! Astounding posting. We're hence happy. May possibly under no circumstances bring to mind this sort of element is quite possible along with it... There's no doubt that you will have a superb awareness primarily when contracts by using these content. At this moment please click here Cash Advance With thanks to get awesome information and facts.